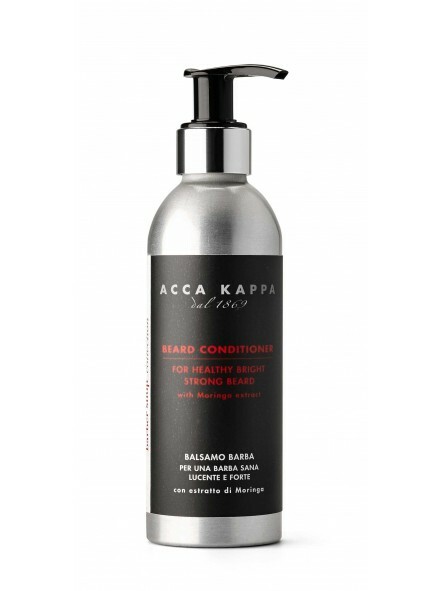 Acca Kappa Beard Conditioner 200ml has been formulated with Moringa extract for a healthy, bright and strong beard. 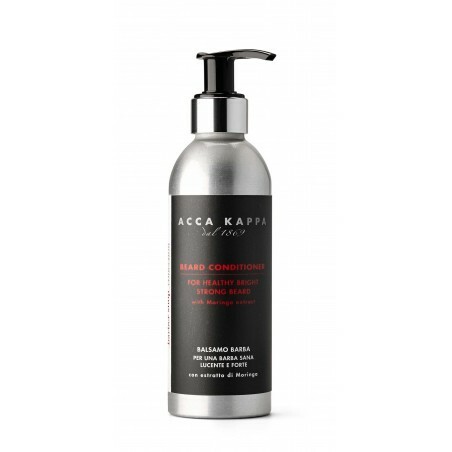 This conditioner has been expressly formulated to nourish and soften beards and moustaches. The Moringa purifying extract helps prevent frizz, making your beard strong and glossy. Use during the first three weeks of beard growth to prevent skin irritation. The natural fresh minty scent enhances this special product that is dedicated to the health and care of the beard. DIRECTIONS FOR USE - After using the beard shampoo, evenly distribute a suitable amount of the product over the beard and moustache area. Leave in for a few minutes, then rinse off the product with plenty of warm water. Tame your beard with an Acca Kappa beard Brush. INGREDIENTS: Aqua (Water), Cyclopentasiloxane, Cetearyl Alcohol, Cetyl Alcohol, Propylene Glycol, Dimethicone, Cetrimonium Chloride, Parfum (Fragrance), Dimethiconol, Polyquaternium-11, Argania Spinosa Extract, Disodium EDTA, Menthol, Hydrolyzed Corn Starch, Hydrolyzed Wheat Protein, Hydrolyzed Soy Protein, Benzyl Alcohol, Glycerin, Moringa Pterygosperma Seed Extract, Lavandula Angustifolia Extract [Lavanda Angustifolia (Lavender) Extract], Arctium Lappa Root Extract, Camellia Sinensis Leaf Extract, Citrus Limon (Lemon) Leaf Extract, Plantago Ovata Leaf Extract, Urtica Dioica Leaf Extract [Urtica Dioica (Nettle) Leaf Extract] , Boswellia Carterii Resin Extract, Capsicum Frutescens Fruit Extract, Cinchona Succirubra Bark Extract, Eucalyptus Globulus Leaf Extract, Gentiana Lutea Root Extract, Juniperus Communis Fruit Extract, Nasturtium Officinale Extract, Panax Ginseng Root Extract, Salvia Officinalis Extract [Salvia Officinalis (Sage) Extract], Urtica Dioica [Urtica Dioica (Nettle)], Leuconostoc/Radish Root Ferment Filtrate, Methylchloroisothiazolinone, Methylisothiazolinone, Citric Acid.